It is widely believed that Waitangi Tribunal Reports issue only after rigorous historical investigation of Treaty claims. These findings then make their way into media reports, onto Government websites, and percolate throughout our education system as apparently authoritative, objective information. But what if Tribunal Reports were one-eyed rewrites of New Zealand history and not worth the paper they are printed on? “The Tribunal consists of a chairperson and up to 20 members that may be appointed at any one time. The chairperson may also appoint a Maori Land Court judge to the position of deputy chairperson. The total membership reflects the partnership [sic] of the Treaty of Waitangi through an approximately equal representation of Maori and Pakeha. “Tribunal members are appointed … by the Governor-General on the recommendation of the Minister of Maori Affairs in consultation with the Minister of Justice. “Members constitute a pool from which tribunals of between three and seven members are drawn to hear claims. The term ‘Waitangi Tribunal’ is used to refer both to the total membership and to the individual Tribunals. Members are appointed to a Tribunal by direction of the chairperson and remain members until the inquiry is completed or they resign. The Tribunal’s underlying premise before it even hears a single claim is that the Treaty of Waitangi created an ongoing racial partnership. Tribunal members are appointed on the recommendation of the Minister of Maori Affairs, so we can safely assume that both Maori and non-Maori members will be Treatyists, and likely to come to the table with strong priors rather than being impartial defenders of the public interest. It is theoretically possible for all Tribunal members hearing a particular claim to be Maori [by which I mean New Zealanders of mixed European-Maori descent who have chosen to identify monoculturally as “Maori”]. More commonly, Maori may be a majority of those hearing a particular claim. 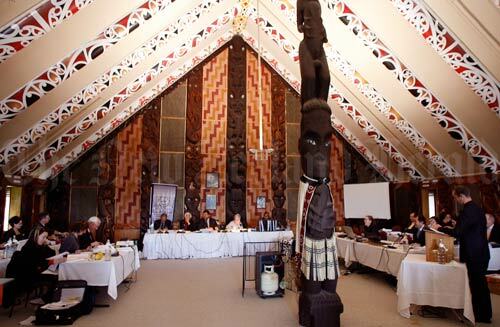 Many Maori have multiple hapu and iwi affiliations, making it quite possible for a Tribunal member hearing a particular claim to have direct links to the claimant group. Indeed, three years into the hearing of the East Coast claim, presiding Judge Stephanie Milroy was obliged to disqualify herself, but only after lawyers for competing claimant groups pointed out that through her Ngati Porou connections, she had interests in five landblocks that were subject to the claim. We can only speculate as to how many other instances of this kind never came to light. Claims are typically heard on the marae of the claimant tribe, hardly a neutral venue. Deliberations are conducted according to Maori protocol. This is likely to prove highly intimidating to non-Maori interested parties seeking to make a representation. Since the claims process is seen as being between the Crown and Maori, third parties have no automatic right to be heard. They can only be heard with permission, which the Tribunal rarely grants, particularly if opposed by the claimant group. Evidence is often given in Maori, with no requirement to provide a translation. As well as being a deliberate act of cultural arrogance, this makes it difficult for non-Maori speakers to have input into the hearing process. Oral evidence is given the same weight as written evidence and is not subject to cross-examination, since according to Maori protocol this is highly disrespectful to a kaumatua. The Tribunal justifies this by asserting that since it is a Tribunal rather than a Court, rigorous evidential standards need not apply. Claimants are legally aided to the tune of millions of dollars from taxpayers, with no requirement to pay this back if successful in achieving multi-million dollar settlements. This encourages what economists call rent-seeking behaviour, also known as “trying it on because there’s a huge upside if successful and no price paid for being wrong,” not that I can recall a single Tribunal Report finding against the claimants. Claimant groups have forced historians they have employed to go away under threat of non-payment and sanitise reports of facts that undermine their case. Those charged with presenting the Crown’s case are supine to say the least. For example, claimants who didn’t sign the Treaty, such as Tainui, Tuhoe, and Tuwharetoa, should have been immediately shown the door. Groups such as Ngai Tahu, Tainui, and Te Atiawa, who’d already received full and final settlements (some, like Ngai Tahu, several times over) legislated for in Acts of Parliament the preambles of which include the words “full and final settlement” should also have been told to talk to the hand. The Tribunal’s recent assertion that contrary to primary source accounts of what the chiefs said on the lawn at Waitangi, Ngapuhi never ceded sovereignty to the Crown, is the latest in a long line of egregious tommyrot to exit this body via the fundament. Who can forget the Tribunal’s “Holocaust of Taranaki” press release likening the closing down of the Parihaka Commune (in which not a single person lost their life) with the state-sponsored Nazi slaughter of millions of Jews during WWII? “It would be hard to imagine any public body less well-organised to get at the truth. “Witnesses were treating with sympathetic deference. “The people putting the Crown’s side of things seemed equally anxious not to offend. “In three months I don’t think I was asked a single intelligent, awkward question. A number of reputable historians, including Keith Sorrenson, Michael Belgrave and Bill Oliver have voiced concerns that the Waitangi Tribunal has become a self-referencing echo chamber for re-writing New Zealand history. According to Dr Byrnes, the Tribunal is not writing “objective history.” Rather, the reports it produces are deeply political and overwhelmingly focused on the present, in that the Tribunal invariably judges the past by today’s standards rather than those prevailing at the time under scrutiny. Other academics share this unease, but reluctant to say anything publicly, Dr Byrnes points out. Dr Byrnes also reveals significant concerns about the mass consumption of Tribunal reports by the media and general public. She believes the Tribunal should clearly state its pro-claimant bias, lest lay people reading Tribunal reports be misled. “The Tribunal makes up history as it goes along. A growing number of New Zealand historians are pointing this out, although most of them are labelled as racist for doing so. Facts are omitted in Tribunal reports, and evidence is shaped in some cases to fit predetermined outcomes. The bias is so obvious, but most historians are too scared for their careers to question the tribunal’s findings. “[T]he Tribunal … has turned out to be a body that is bringing in apartheid to New Zealand. This sounds dramatic, until you see how it advocates for race-based access to certain areas, and race-based management policies for Crown land, and now, twin sovereignty, which constitutionally is worse than anything that happened in South Africa during the apartheid era. Clearly, any thinking New Zealander should have absolutely no confidence in anything that comes out of this body. Excellent article. Required reading for all Kiwis. Agree with all the above. The problem being what to do about it? A number of political parties have been floated to try to deal with this problem, but all have foundered. The problem? wWhat to do with an apathetic public who have been mollycoddled for such a long time they cannot see anything happening to upset the current status quo. Current world events are showing that change, that is not properly organised, can have many unplanned results, and that change is taking place insidiously in this country now. It should be disbanded immediately. But can you imagine this appeasing Government doing that? They are a corrupt body and are making decisions which are leading to fraudulent settlements. They are rewriting history on the hoof to fit in with whatever any claimants desire. I think you are exactly right, Helen! It’s just another part of the insidious gradualism that is steadily strangling this once fine country – aided and abetted by the PDF (pseudo-democratic fascism) that fronts for our government at all levels. We, the people of New Zealand, seem to have been overly represented in government by weak an impotent reproductions in the mold of Chamberlain and Nero, the consequence of which has brought us to this impasse. The ruthless Nazi propaganda minister of WW2, Joseph Goebbels, would have been proud of the tactics currently being employed by the Maori Tribunal. Now, just as it was then, the fear of opposing the views and methods of the evil regime assisted in the atrocities, which we of the older generation are sadly familiar with. There are some frightening similarities manifesting within the Tribunal’s [modus-vivendi /operandi]. The fundamental premise being that they consider themselves as a “Superior” race, while those of non Maori descent are being increasingly treated as second class citizens. Other parallels are also evident, those of twisting and corrupting history in order to fit the ideology and agenda of some “Master plan” which is being germinated and cultivated within the minds of the young at schools, perpetrated by intimidated and frightened central and local government officials. They are not interested in the protestations of we “Oldies” or in what we think or say, because they know that this opposition is finite. [sic transit gloria mundi] “Thus passes the glory of the world”, will be a fitting epitaph, unless we do something collectively radical and so audacious that it will reverberate around the world!